Australia’s indigenous population is very important for football. The indigenous community makes up only 3 per cent of Australia’s population and yet a staggering 12 per cent of players in the AFL are regarded as indigenous Australians. Last week the AFL and the Federal Government took a step to strengthen this relationship, establishing a $2.4 million program centred on encouraging indigenous Australians to take up Australian Rules. The program will be divided into two parts. The AFL Club Fostering Program will see AFL clubs adopt an indigenous community. This club will then conduct classes covering a variety of topics, from football clinics, to coaching courses to how to live a healthy lifestyle. The All Stars program will see AFL clubs mentor fifteen youths, and assist them in finishing school and securing a job. The cost will be split evenly between the Australian government and the AFL. 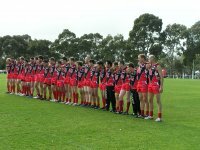 Increasingly the Australian football community is recognising the important role the indigenous community plays to Australian Rules. Marn Grook is frequently mentioned as a possible origin of our game. Names like Burgoyne, Wells, Bateman, Farmer, Goodes and Wirrpanda are current examples of football talents, all of whom are classed as indigenous Australians. Adam Goodes is not only the current Brownlow Medallist, but a two-time recipient of the award. The Tiwi Bombers, an indigenous football team who completed a ‘trial season’ in the 2006/07 NTAFL competition won six of the seven games they competed in. It is a credit to football to have Australians, who arguably have the greatest claim on the country, pulling on a football jumper that a new arrival in Australia is encouraged just as eargerly to do likewise. Further reading on this AFL and Federal Government initiative can be found at Govt and AFL in indigenous partnership and AFL clubs to help young Aborigines.